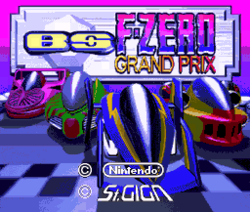 BS F-Zero Grand Prix is a Satellaview-exclusive remix of F-Zero. It does not feature multiplayer directly; players race against computer opponents, and, if they win, their score is submitted to the BS-X scoreboards. The game plays differently to its follow-up BS F-Zero Grand Prix 2. First the player watches a demo of part of the course. They then get to choose a racer and practice on a simplified version of that course (some traps and obstacles are removed) with a ghost car showing the best route. Once they have watched and practised all tracks the League starts over again, this time with obstacles and computer opponents.